Desert Survivor: What is a Desert? I've been writing about deserts for awhile, but it seems that it might be a good idea to define what a desert is. The most basic definition is that a desert is an area that is moisture deficient; more water evaporates than is received. Another definition, more quantitative in nature, says areas that receive no water for at least 12 consecutive months are extremely arid lands, those that receive less than 10 inches (less than 250 mm) a year are arid lands, and those that receive 10-20 inches (250-500 mm) a year are semiarid lands (steppes rather than deserts). Deserts are not necessarily hot. Antarctica classifies as a desert because of the small amount of precipitation it receives. 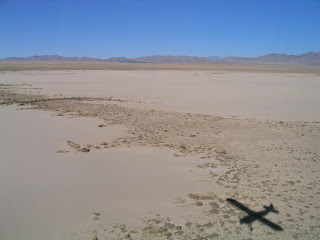 In fact, over one-third of the land masses on our planet are considered to be deserts. Sand covers only about 20 percent of deserts, with a variety of soils, bare rock, and even ice constituting the other desert bottoms. The word desert is derived from the Latin desertum, which means "unpopulated place." That was largely true at one time, but due to humans creating diversions and developing the combustible engine that pumps groundwater up to the surface, over 500 million people live in the deserts. Desert cities include Phoenix, Arizona; Riyadh, Saudi Arabia; Greater Los Angeles area, California; Dubai, United Arab Emirates; Juarez, Mexico; and many others. Although at first it might appear that few plants and animals live in deserts, biodiversity is often high. Animals might not be readily seen because some spend part of their lives in burrows to escape temperatures that are not conducive to their lifestyles, while others are primarily active at night. Some animals (like kangaroo rats) have evolved to be able to live without drinking water by creating water during metabolic processes when they digest food. Plants are often drought- or salt-tolerant to be able to withstand the harsh conditions. Some desert plants have long taproots to be able to reach underground water. Humans have adapted to survive in the desert by being nomadic to find food and water sources. Traditional desert dwellers include the Bedouin, Tuareg Tribe, and Pueblo people, who live in hot deserts, and the Inuits, who live in a cold desert. Many more people have moved to the desert in the last 75 years due to the invention of air-conditioning and highly engineered water systems.